Our casita, Cielito Lindo, is located in exclusive North Hills, situated at an altitude of 7,200 ft. on a serene and beautiful hilltop, three minutes from the historic Santa Fe Plaza, galleries, restaurants, shopping and night life. Experience sunrises and sunsets as you've never seen before. Night is especially magical in North Hills. In the summer, sit outside on your private portal listening to the wind sighing in the piñons. Gaze at stars so bright you can almost touch them. Hear the howl of coyotes in far-off hills and, in between, a serene and profound silence unique to the high desert country of northern New Mexico. In the winter, build a roaring fire in the kiva and snuggle in with a book, music or television or just listen in silence to the crackling fire. Cielito Lindo is a place to reconnect - with yourself and with the world around you. Situated on a hilltop off a quiet street with private parking, Cielito Lindo offers a large living room complete with a Kiva fireplace, 50" TV, and stereo system. Enjoy home cooked meals from the spacious fully equipped kitchen or take a short walk down to the plaza for shopping and restaurants. The bedroom offers a queen bed, along with plenty of closet space. The den can also be used as a second bedroom complete with a sleeper sofa or use it as an office while working away from home. 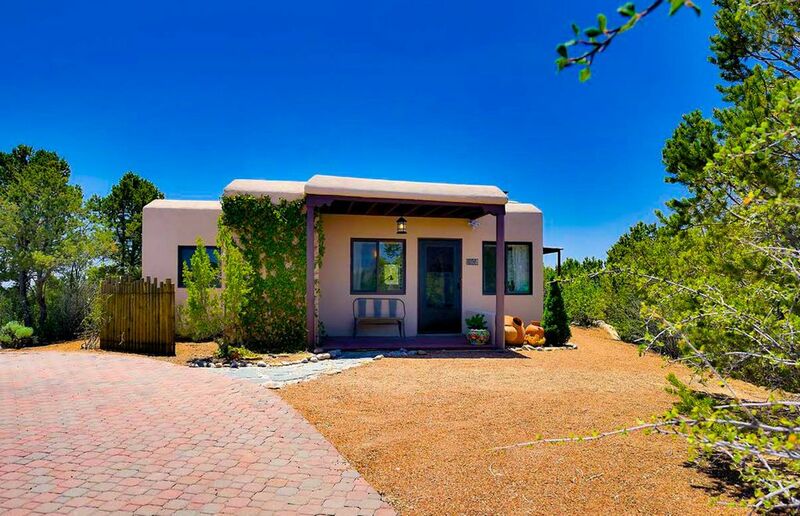 This casita is ideal for a writer, painter, arts lover or family in search of serenity and all the natural beauty that Santa Fe has to offer. Conveniently located about 1 mile from the historic Santa Fe Plaza, shops, grocery stores, galleries and museums; a 12-minute drive from the world-famous outdoor Santa Fe Opera; and 17 miles from the Santa Fe Ski Basin. - Path to a private area to view sunsets over the Jemez Mts. The owners live in a separate house on the property and are available to answer any questions you may have about Santa Fe, the surrounding areas, or your lodging. Chris grew up in Brazil, works on maternal, newborn and child health in lower-income countries and believes that it is diversity--of people, beliefs and experiences--that binds us together and makes us stronger. We bought this property because we love the variety that Santa Fe has to offer. The arts scene is incredibly vibrant--art and photo galleries galore, plays, bars and night clubs with music into the early morning hours and, of course, the world famous open air Santa Fe Opera is only a 12-minute drive from our property. We also love the outdoors and have the alpine meadows and ski basin of the Santa Fe Wilderness to hike in 6 miles to the east and the mysterious, red rock canyons and Ghost Ranch of the vast Piedra Lumbre basin to the northwest. Wildlife abounds around our property--eagles, ravens, coyotes, bobcats and bears live in the surrounding hills and don't be surprised by the occasional roadrunner running across the road in front of you. Plus, we are both skiers and love that we can drive out the property and 35 minutes later be buckling on our ski boots at 10,600 ft.
Santa Fe is far south in the US but our house and casita are at 7,200 ft. in altitude, so the winters are warm with bright sun and the summers cool and dry. With 323 days of sun a year, northern New Mexico is an ideal vacation spot. Our family loved the Casita! So comfortable, with everything we needed, and easy to get around town from there. The fireplace was an extra special feature. Hope to come back! We absolutely loved this casita and look forward to visiting again in the future! Very clean, comfortable and wonderful owners!! Thank you for an excellent place with wonderful views and privacy!!! I stayed in Santa Fe for 34 days and the accomodations were great! Casita was clean, spacious and included all amenities. I would definitely recommend to anyone coming to Santa Fe. The owners were wonderful and always available!